The defence and foreign ministries deny reports of Moscow sending troops to the war-ravaged country but Russian economic contributions could create welcome changes in Afghanistan. Will Russia send its troops to Afghanistan after coalition forces withdraw in 2014? The subject was brought up after media reports cited Russian Defence Ministry representative Sergei Koshelev as saying Russian repair bases may be established in Afghanistan. The Defence Ministry and the Foreign Ministry have subsequently denied the reports. Foreign Ministry spokesman Alexander Lukashevich insisted: “Moscow’s position, that a return of the Russian military to Afghanistan is impossible, remains unchanged.” He said the speculation was the “fruit of someone’s sick imagination.” While we know there’s no smoke without fire, we can be confident that Russia isn’t going to send its troops to Afghanistan. So far as I know, there are no such plans within the CIS or the Collective Security Treaty Organisation, either. At the same time, let’s not forget that Moscow and Kabul have a military and technical co-operation agreement, under which, among other things, Russian specialists repair Afghanistan’s Russian-made military equipment. It’s possible that the media mistook some of this work in Afghanistan as a preparatory step towards the establishment of Russian bases. But the pull-out of a considerable portion of the peacekeeping forces from Afghanistan in 2014 is forcing Moscow to re-evaluate the threats that will emerge on the borders of CIS countries. The situation appears even more uncertain given Afghanistan’s presidential elections scheduled for April 2014, in which the two-term president, Hamid Karzai, is constitutionally barred from standing. This election could lead to new instability, especially taking into account Karzai’s recent statements about the possibility of letting the Taliban ideologue Mullah Omar take part in the election process. Viktor Ivanov, director of Russia’s Federal Drug Control Service, told a recent international conference in Moscow on Afghanistan’s future beyond 2014 about an alarming increase in heroin and marijuana production in Afghanistan. He said Afghan narcotics, supplied to 100 countries worldwide, killed about one million people last year. But the most dangerous thing, Ivanov said, was that the drug trafficking was now fuelling regional tensions. Drug traffickers were actively influencing the country’s political development, turning Afghanistan into a global drugs production centre where the government is forced to serve the interests of criminal cartels. Western experts see three more or less realistic scenarios in Afghanistan. Under the first scenario, the Afghan government would cling to power, maintain the status quo, and maintain the country’s integrity after the presidential election and the international coalition’s pull-out. Under the second scenario, Afghanistan would split into two parts along ethnic lines. Kabul would keep the northern part under its control, while the armed opposition would come to power in a new state in the south. British experts have offered a third scenario, which Russia also recognises as being a distinct possibility. They believe that after the presidential election, a creeping decentralisation will start in Afghanistan. This will result in unlimited autonomy springing up in the country’s southern regions densely populated by the Pashtun people. Some field commanders fighting against Kabul have already supported this plan. In answer to the question about the steps the CIS countries were planning to take to adapt to changes in Afghanistan beyond 2014, Russia’s foreign minister Sergei Lavrov said the future of Afghanistan had been discussed at a meeting of CIS foreign ministers on April 5 in Uzbekistan. Lavrov said: “The Collective Security Treaty Organisation has a common strategy vis-à-vis Afghanistan, there are relevant plans within the Shanghai Co-operation Organisation, and there are joint efforts of special services at the anti-terrorist centre that exists as part of the CIS.” He also said all CIS countries agreed it was necessary to secure the borders of Afghanistan’s neighbours, assist Kabul with its efforts to strengthen its security forces, and help Afghanistan resolve its economic problems. Russian experts believe the development of a new economic strategy for Afghanistan would change the course of the country’s development. Yuri Krupnov, chairman of the Society for Friendship and Co-operation with Afghanistan, said the country would need $50bn (£32bn) for accelerated industrialisation through 2020, of which Russia’s contribution could reach $7bn. Unesco could be in charge of raising the money. 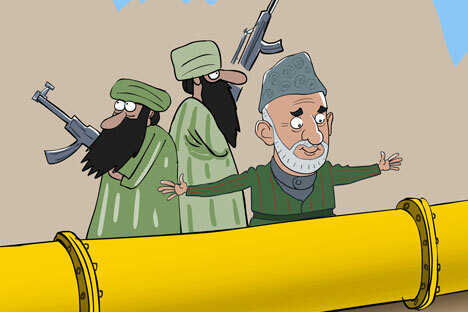 According to Russian experts, the money is needed to launch pipeline transit projects from Turkmenistan to India and from Iran to India via Afghanistan, as well as for the electrification of the country. But it’s obvious that implementing these plans directly depends on the ability of the new Afghan leadership that will come to power in 2014 to maintain stability. But the situation on the ground looks like a vicious circle where fully-fledged industrialisation in Afghanistan is impossible without resolving the security issues – and changing the situation with drug trafficking and security is impossible without industrialisation. So long as this vicious circle remains unbroken, countries that may be willing to contribute financially to the plight of Afghanistan will be less willing year after year to allocate new aid to Kabul. Currently, the chances that the Afghan government will be able to keep the country under control beyond 2014 are looking slim. Yevgeny Shestakov is international affairs editor at Rossiyskaya Gazeta.